Dragon fruit, also known as pitaya or the strawberry pear, is a beautiful tropical fruit that is sweet and crunchy. It tastes a bit like a cross between a kiwi and a pear. Though it may look intimidating, cutting and preparing this exotic fruit is easy. You can enjoy eating it in fruit salads, it can be used to create tasty drinks and desserts, and it is a wonderful, healthy snack on its own. Dragon fruit is grown in Southeast Asia, Mexico, Central and South America, and Israel. The plant is actually a type of cactus of the genus Hylocereus, which includes only about 20 different species. The fruit comes in three colors. Two varieties have pink skin, but one has white flesh while the other is red. The other variety has a yellow skin with white flesh. Dragon fruit is low in calories and offers numerous nutrients, including Vitamin C, phosphorus, and calcium. It also supplies a good amount of fiber and antioxidants. Dragon fruit can be found year-round, though the season peaks in summer and lasts into early autumn. Its gnarly looking skin makes it easy to spot in any produce market. To choose a ripe dragon fruit, look for bright, even-colored skin. A few blemishes on the skin are normal, but if the fruit has a lot of blotches, it may be over-ripe. Hold the dragon fruit in your palm and try pressing the skin with your thumb or fingers. It should give a little, but shouldn't be too soft or mushy. If it's very firm, it will need to ripen for a few days. Dragon fruit will cut quite easily. The flesh inside may be white or red and both will have tiny black seeds that are edible, just like kiwi fruit. Place the dragon fruit on a cutting board or another clean surface. Cut the fruit straight down the middle with a sharp knife. The fruit can then be separated into two sections. Removing the fruit's flesh is quite simple and similar to an avocado. Note that the skin is not edible. Run a tablespoon around the circumference of each section to separate the flesh from the skin. Using the spoon, lift the flesh out of the skin and place it on the cutting board. Reserve the skin for serving, if desired. Also like avocado, some dragon fruit fans will simply eat the flesh right out of the skin. It's the perfect container for a quick snack, just grab a spoon and dig in. Turn the mound of flesh over, checking for any residual pink skin. If there is any skin, slice it off. Now you can slice up the flesh. Cubes work well for eating the fruit fresh, but you can cut it any way you please. Do you have a melon baller? Use it to scoop out the dragon fruit's flesh to quickly create fun little balls that are great to nibble on. If desired, you can return the cubes of fruit into the skin shell to serve, or simply transfer to a serving dish and enjoy. Dragon fruit's sweet taste also makes for some delicious drinks. You can quickly make dragon fruit juice with a juicer or use the fruit's flesh. Try it in an easy dragon fruit martini or as a tasty and beautiful smoothie. 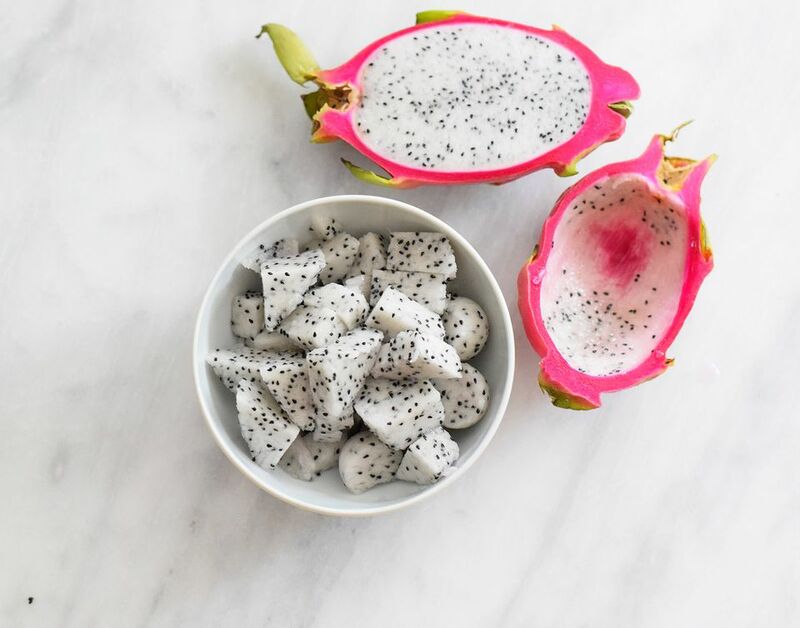 Once you learn to love the taste of dragon fruit, you'll think of many more ways to enjoy it. Have fun and see what it can do with some of your favorite recipes. Remember that it pairs well with almost any tropical fruit, so mix it in with mango, papaya, pineapple, or whatever you like.